The Frogs – Riot Act, Inc.
Wed. Aug. 1 ~ 7:30pm, Tues. Aug. 14 ~ 7:00pm, Mon. Aug. 20 ~ 7:00pm, Tues. Aug. 28 ~ 6:30pm, and Fri. Sept. 7 ~ 6:30pm. ADDITIONAL PERFORMANCE ADDED – Fri. July 27 at 6:15pm at the Center For the Arts outside by the glass doors to the Main Theatre. 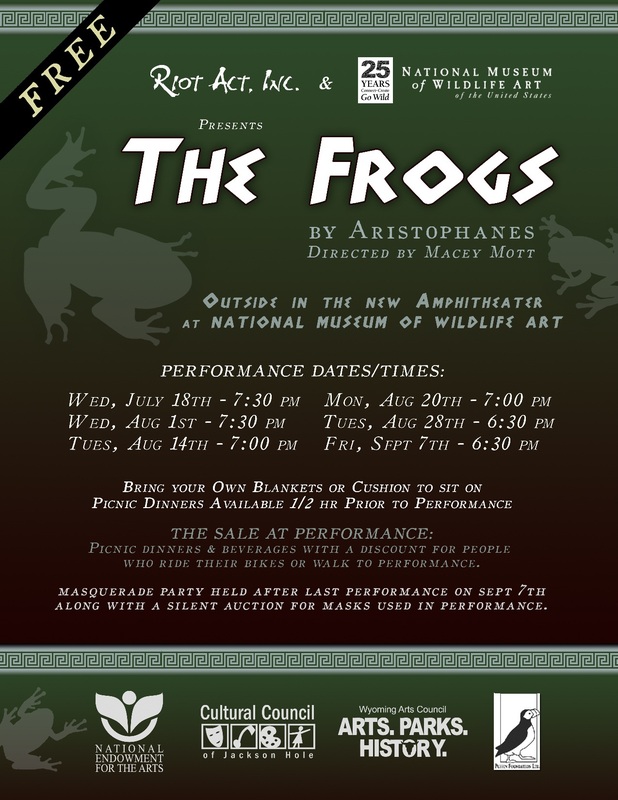 The Frogs is a project in conjunction with the National Museum of Wildlife Art. The play will be performed outside in the museum’s new amphitheater from mid-July to early Sept. during sunset as a free outdoor event. After reading the script a few months back, Jamie Reilly dubbed this play as the original buddy road-trip story. This classic Greek comedy follows Dionysus and his trusty servant, Xanthias, as they travel to the underworld in search of the world’s greatest playwright. Many adventures and contests paint the story including a run in with The Frogs on the River Styx. The play will be staged in the traditional Greek style including mask work by Evie Lewis, original costumes by Macey Mott and Christina Croxell, and using the sun for lighting. Picnic dinners, provided by Shades Café, will be for sale starting a half hour prior to performance time. Audience members choosing to ride their bicycles or walk to the show will receive a discount on the picnic dinners. Veggie or Meat Picnics are $15 each with a $2 off discount if you bike or walk to the show. Special Frog Cupcakes are $3.50 each. Riot Act, Inc. T-shirts will be available for sale for $15 each. Both men’s and women’s sizes are available. We recommend for mature audiences and there is some crude language in the show. *Project made possible by grants from Wyoming Arts Council, The Puffin Foundation and Your donations.